It's only been a few days, but I've already had chances to use both standard sizes of the three different editions of the new missal one is most likely to encounter here in the States: those of Magnificat, Liturgy Training Publications, and the Catholic Book Publishing Company. I have formed some clear and distinct opinions. The Magnificat edition is my least favorite. The art is magnificent, for sure, but is so eclectic as to make the book seem awfully busy. There are only tabs for the beginning of the Eucharistic Prayers rather than for each page turn therein. Even in the larger missal the print isn't very big. The thing feels like a coffee table book rather than a liturgical tool. All that being said, Magnificat wins for the best ribbons. As anybody who knows me will say, I do love proper ribbons in my liturgical books. Catholic Book Publishing Co. has a long history of producing liturgical books that are durable and clear, but painfully plain and homely. Your breviary from them won't fall apart. Despite the baptismal water in your infant baptism ritual and the rain water in your funeral ritual, they still serve time after time. That being said, they aren't much to look at. Therefore, I was pleasantly surprised to see that CBPC's editions of the new missal are quite lovely as well as pretty usable. Not they didn't fall prey to a little bit of creeping elegance as well; the fancy capitals are pointless and not very readable. My favorite, though, are the new missals from LTP. I've appreciated much of their work for a long time. I think they make the best lectionaries, and their English-Spanish facing-page edition of Pastoral Care of the Sick is one of the most practically useful priestly go-to books out there. Their new missal is boxy and plain, but eminently readable. There are clearly labeled tabs for every page turn in the Eucharistic Prayers and the Communion Rite, and in different colors, which is very helpful. There's not much art, and what is there not everyone will like, but again, this is a missal, not a coffee table book. The only thing that bugs me a little on the topic of art is the blank left-hand page at the beginning of the Roman Canon. Really? There ought to be an image of Christ crucified there, como Dios manda. Maybe I'll have someone draw one in. Today being the feast of St. Andrew, according to my Plan for the Minimum Use of Eucharistic Prayer I, it was my first time praying the Roman Canon in the new translation. It was the occasion of my first real stumble over what some folks are calling the awkwardness of the English. Remember, Lord, your servants N. and N.
whose faith and devotion are known to you. and all who are dear to them. I stumbled right on the "or" and lost the thread, as my dad would say. Also, the punctuation of the typical edition would have suggested a helpful colon after "praise." Not that I'm making excuses for my stumbling and failure to study hard enough before offering the prayer. Journeying through these first days of the new translation, I keep finding new appreciations. 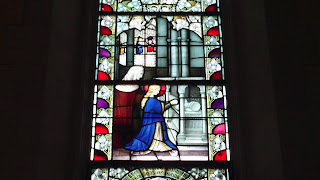 Today I'm thinking of two of the private prayers of priest, each of which restores somewhat the sense of Holy Communion as a sort of medicine, a healing remedy. The first is the second option for the private preparation of the priest, which concludes by asking that the priest's communion be a "healing remedy," translating the Latin medela. The second is the prayer at the purification of the vessels which concludes by asking that the communion just made be a "healing for eternity," translating the Latin remedium sempiternum. These prayers really speak to my heart at this moment in my journey as a Christian. When I was first trying to live the faith, I think I looked on the sacraments as if they were sources of power for living the agonistic, counter-cultural life I wanted to admire in myself. That was my vainglory. Going on twenty years later, I realize that I am very far from surrendering to any devout energy to become heroically virtuous. Rather, I need the healing touch of the divine Physician just to begin to learn how to be a repentant sinner. May the sacred mysteries of which God has made me an awkward and negligent custodian be for me--and for those I am unworthy to serve--a healing remedy, now and into eternity. Amen. Reflecting a little more on my first experiences of praying the Mass in the new translation, I have to say that the translation is a shift on the spiritual level. The best I can do in naming it right now is to say that the Mass feels more supplicative. With all of the appearances of humbly and graciously in the various petitions, the restored intensity of the Confiteor, as well as many other and various aspects, the new translation locates the pray-er somewhat differently before God. Well, the big day has come and gone. In the past twenty-four hours, I've celebrated three Masses with the new translation. What I notice the most is that I don't feel like I have that much to say. In some ways it felt like when I was first ordained priest; I didn't feel like I was praying that deeply because I was just trying to do and say everything properly. Certain little things I appreciated. For the two Sunday Masses yesterday I used Eucharistic Prayer III. I loved praying from the rising of the sun to its setting, so much closer as it is to the image from the scriptures, and removing as it does the temptation of those who added a 'north to south' to the old 'east to west' in their missing of the metaphor. And also with you. It sure is stuck in the voice. The seminarian who served the Mass that was my first with the new translation said it straight away at the greeting, and right into my microphone. Despite looking forward to the change for so long, I said it myself to the deacon before he proclaimed the gospel at the next Mass. Just to be funny, at the Sign of Peace, when the deacon said to me, peace be with you, I said, and also with you. Tomorrow there will be a new trouble as a fresh liturgical dubium arises for us English-speaking Franciscans. Tomorrow, you see, is the feast of All Franciscan Saints. The proper prayers for this Mass are in our proper sacramentary, which is, of course, embedded in the translation that is now suppressed. We don't have a new one according to the 3rd edition Roman Missal. So what to do? My best guess is that we take the proper prayers from the old book and the rest of the Mass from the new. One of my disappointments with religious life as I have found it is that in some ways we seem to have abandoned the classic concerns of the spirituality of our state. Not that I think old-fashioned ideas about spirituality are good just because they are old, but sometimes I feel that common life is very much in need of listening to our spiritual fathers and mothers from the past. One area where I think this is especially true is in the use of speech. Writing from the tradition of religious life is full of admonitions, warnings, and invitations to ascetical practice (we would say 'spiritual practice') in the use of speech. The dangers of gossip, detraction, and idle chatter have long been recognized. And yet, in the course of my own training and formation in religious life, I have never heard anyone recommend examination of conscience on these sorts of things, nor indeed much concern for their harmfulness at all. I was thinking about this and confessing to God my own sins in this area as I said my prayers this morning. In the Office of Readings today, St. Columban reveals that he knew well these temptations and dangers: "Men like nothing better than discussing and minding the business of others, passing superfluous comments at random and criticizing people behind their backs." It's a very destructive business, and not only rampant but more or less uncriticized in religious life as I have experienced it. Here's a real-life example: Apparently two brothers had a tense and unsuccessful conversation. This conversation was reported to me several times by various other brothers. In each case, the details, setting, and motivations presented were different in such ways as to present one of the brothers at fault and the other innocent. In one telling one of them was totally open and good, and the other dismissive and cruel. In another the analysis was reversed. What really happened? I don't know. But what I do know is that in the reporting of the incident it got to be about blaming rather than anything spiritually useful. The devil is quite happy to make use of our idea of right and wrong, so long as it convinces us that what is wrong with our communities is someone else's fault. Beyond all of the well-known negative effects of gossip, detraction, and calumny, the ultimate spiritual problem is that we become to one another not the persons created by God, but the narratives that are told about us. We begin to treat each other according to this constructed identity, because it's easier than getting to know each other in all of our complexity. At worst, we can begin to act ourselves either in conformity or reaction to this false and shallow caricature of our true self. If we do this long enough, we can even forget who we really are. Because this false self is also unknown to God, we will also always feel like there is something fundamentally amiss with our prayer life, but not be able to name it. I was telling someone this old tale yesterday, and he encouraged me to blog it as an example of being embedded in a Catholic imagination. One of the grand adventures of my young life was the first half of 1993 when I lived in Galway and was supposed to be attending the university there. Around the middle of it all, I and this other kid Travis took a month to travel on the continent. We had no itinerary or plan. Nor did I keep any record of where we went. But the fun thing is that I can reconstruct the trip by liturgical time. I was in my first year as a Catholic then, and wanted to be very devout. I know that we were in Paris for the Mass of the fifth Sunday of Lent. We actually had a hard time getting to Mass because we hadn't realized that the clocks had been set forward. A friendly American with whom we were playing hacky sack outside Les Invalides set us straight. I don't remember if the Mass we finally got to was on Sunday itself or was a vigil, so I can only conclude that we left Galway on either Friday or Saturday of the fifth week of Lent. By Passion Sunday we were in Prague, having been through Bruges, Amsterdam, and Munich on the way. How could I forget the one priest reading the whole of the Passion himself in a language that was totally unknown to me? During the Prague spell we had added to our party this girl named Christine whom we had met in Germany. I remember that she and I got along very well and that she was fond of strawberry milk. When the Triduum rolled around, I remember that we were in Verona, having stayed almost a week in Prague (it was very fun) and a night and a day in Vienna on the way. I remember going to the Easter Vigil in some little church and sharing my St. Joseph Sunday Missal with an American girl I met there. I think we went out for a paschal drink after Mass. By the second Sunday of Easter I was in Assisi by myself. After a day there my traveling companion and I had decided to split up. I wanted to stay in Assisi for something like retreat time, and he wanted to go to Switzerland to try to go skiing. I think it was his birthday so we went and ate pizzas and drank a bunch of wine and the next morning he got on the train and I was alone. It was a wonderful week or so I spent in Assisi by myself, visiting the churches, walking the paths in the hills, and praying. I know I left Assisi on a Friday, which had to be the Friday of of the second week of Easter, traveling straight back to Galway via Florence, Milan, Paris, Cherbourg, and Rosslare. I remember getting off the bus by Eyre Square in Galway on Sunday night at about nine o'clock, without having been to Mass. I knew that I could still make it to the ten p.m. Mass at the university, but not having had any food in a couple of days (I had run out of money) I went to the ATM instead and went for something to eat. So it was surely Monday of the third week of Easter when I went to Galway Cathedral to go to confession, since I hadn't been in a month and I had missed Mass the Sunday before. When the priest asked me why I had missed Mass, I told him the whole yarn about how I had counted my money wrongly and had to travel straight from Assisi to Galway over two days and two nights with nothing to eat, how I had to search my backpack for French change to get from one station to another on the Paris Métro, and of various other misadventures. Of course the priest enjoyed all of this immensely. The Irish love stories. Having written some hard things about the vocation of the common life as well as having had some other conversations on the stark gravity of its challenges, I was thinking that I should write something encouraging about community. I guess this was somewhere in my heart as I was reflecting on the Presentation of the Blessed Virgin Mary this morning. As St. Augustine reminds us in the Office of Readings today, a true Marian spirituality means that each Christian disciple is given the work of doing spiritually and ministerially what our Blessed Mother did historically. We are to open ourselves to hearing the Word of God, consent to conceiving the him in our lives, give the Word flesh from ourselves, and bear him to the world he burns with desire to save. But we also keep in mind that the mystery of the Lord's Nativity teaches us that the incarnate Word is born as a vulnerable infant. He is recognizable as the Word made flesh, for sure, but will have to be nurtured and grow before he heals, teaches, proclaims the Kingdom of God, and finally gives himself up to death that the Spirit may be handed over as the living principle of Christ's faithfulness at work in the world. In this sense, the vocation of Christian family or common life is something like that of the Holy Family. As grace builds on the unique and unrepeatable creation that is each member, a unique and unrepeatable revealing of the Word made flesh is born into the world. Each new moment in this ongoing work of grace is just as vulnerable and in need of care as the infant Jesus Christ. In community we are given the work of nurturing, protecting, and caring for the graced gift to the world that God desires to make out of each individual member. Many times in my life as a Christian a comment or conversation that didn't strike me much at the time will come back to me later as helpful and important. I believe this is one of the many ways the Holy Spirit tutors our thoughts. Lately a word from my academic adviser from over a year ago has been coming back into my reflection. I was just beginning the doctoral program and discerning which courses to take. In my shallowness I was doing so by thinking about networking and allegiances and that sort of thing. My adviser cut through my false discernment with this comment: "Professors so-and-so and I have as our only concern your salvation." I had been thinking about developing relationships with my teachers in worldly terms, without realizing that they saw their care for me as Christian ministry. I've been thinking lately about how good it is to adopt such a practice of trying to look upon others in terms of their salvation. Specifically, I've been thinking about how it could be a means to learning chastity in community. To arrive at bodily chastity according to one's state in life is nothing to be discounted; it can be very difficult and requires much prayer and concerted ascesis. Nevertheless, such is only the beginning of chastity as a positive virtue. Chastity is the virtue by which we are able to perceive and interact with other persons as the discrete, unique, and unrepeatable creations that they are, with all of the dignity thus implied. Chastity is the means by which we are able to let go of all possessiveness, manipulation, the over-investment of our own fears and frustrations in others, and all of the many ways, both subtle and glaring, that we treat others not as persons in their own right, but as the dramatis personae in the drama of our own interior issues, anxieties, and disordered preoccupations. Chastity frees us from the instrumentalizing and commodification of others that derives from our own fears and interior injuries. By trying to consider the salvation of others as the end of our relationships with them, we can free ourselves for chaste relationships. Here is the place where chastity and charity coincide; by trying to conform my relating to another to the unique and unrepeatable grace built on nature that God wills for him or her, I come to be truly loving because I am willing only the best happiness for him or her. 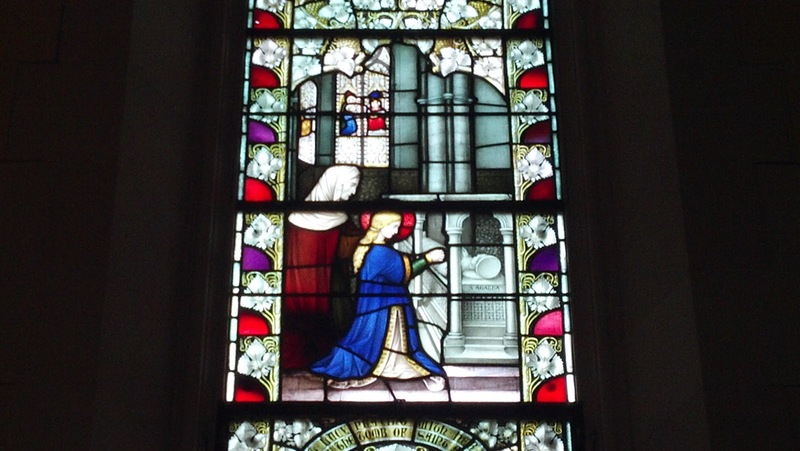 St. Lucy prays with her mom at the tomb of St. Agatha. I love how there are stained glass windows in the stained glass window. Sometimes in religious life we get the dangerous idea that community life is supposed to be a devout and supportive 'home base' from which we become energized to go out and embrace the Cross and work for the Kingdom of God. In fact, this is not exactly the case. Religious life itself is supposed to be an embrace of the Cross. If you want there to be some kind of 'Miller Time' at the end of a long day of carrying the Cross and living the life of a disciple, you're still in the world. At least in male religious life, I think we sometimes exacerbate this trouble by selling a false dilemma between the secular priesthood and religious life. 'Why be a lonely and overworked diocesan priest when you can enjoy the support and care of brothers living in community?' Too quickly this becomes an invitation to think that religious life will meet my emotional needs and desire for intimacy. It might in some places and during some times, but I will also find myself feeling very lonely sooner or later. "You should accept as a grace all those things which deter you from loving the Lord God and whoever has become an impediment to you, whether they are brothers or others, even if they lay hands on you." That's the depths of evangelical minority. To thank God even for those around us who seem to make it hard for us to love God and live the religious life we think we want. Why? Because at the heart of it we love ourselves more than we love God, and the flesh is always inviting us to love prayerfulness and the idea of ourselves as devout and observant more than we love Him. But we came to religious life not to seek conviviality or peace, or emotional intimacy or safety, or even prayerfulness or the natural joys of devotion, but to seek Jesus Christ and him crucified. "you should engrave this truth on your heart: you have come to the monastery for no other reason than to be worked on and tried in virtue; you are like a stone that must be chiseled and fashioned before being set in the building. Thus you should understand that those who are in the monastery are craftsmen placed there by God to mortify you by working on you and chiseling at you." But note also that this is an invitation to humility, when we realize that God has perhaps made us annoying and challenging to those around us for the sake of their salvation. When we keep this in mind, we can notice how much others forgive us and wash our feet on a daily basis. This final observation is one of the most reliable roads to a blessed humility. The sacristan was at the end of one jug of wine and didn't want to open a new one. There was only a little for the cruet. "Is this enough for you, Father?" she asked. "I don't want to mix the old wine with the new," she continued. To which the priest affirmed, "The Lord himself forbids it." But I think it's an important counterpoint to keep in mind that there is also probably a greater proportion of priests and religious in hell. So it goes both ways. God gave me my religious and priestly vocation not because I was special, but as an act of mercy. This was God's best bet for saving me. It's the best way for me to become a saint. But I also know that if I become worse on account of religious life and the priesthood, I will be far worse than I could have ever become without them. My early-morning walk to the Poor Clare monastery for Mass on Mondays is one of my favorite moments of my week. The peace and quiet, the slow progress and regress of the dawn over the course of the year, the contemplative mood of the early morning, the summo mane as the rubrics of the Liturgy of the Hours call it, I find it all deeply refreshing. This morning as I was walking down one particular street I started to look at the walls of a building off in the distance. The rightness of the right angles, the straight flatness of the outer wall, all of it spoke to my mind of the reasonableness of what exists, the benevolence of the ultimate Order and Reason that grounds it and from which it came, and the affinity of the created, reasonable minds of the builders and architects, along with mine as an observer, to the Word that is the Wisdom and Eternal Art of God. It reminded me of one of the important moments of preparation the Holy Spirit worked on me before I came finally to confess Christianity: for a brief period, in my later teen years, I got really into math. I had always struggled with arithmetic as a child. I still have trouble adding and subtracting. (Years later, to my delight, when I became interested in mathematical logic and, I have to admit, computer folklore, I discovered that the mental and logical errors I had been making since the first grade were well known and even had names.) It was a great liberation, as I made my way through high school, to arrive at geometry, higher algebra, and the calculus. I started to love it. The math spoke to me in an obscure way of some unadorned but orderly beauty at the Heart of everything. I even went to college with the half thought of becoming a math major. For better or for worse, as my religious quest became more explicit in college I got sidetracked into philosophy and religious studies, and ended up majoring in them instead. Nevertheless, today I am grateful to be reminded that one of the first ways that I began to love the God who was loving me and calling me all along was through the mysterious and stark beauty of number. Over the last two days covering parish-priest duty as part of my new found employment, I had the chance to do a lot of random reading. One of the things I read was this volume of Benedict XVI's catechetical talks on creation and the fall, which one of the brothers lent me so long ago that I have forgotten whom it was. So, if I want to become more charitable and less aggressive, more peaceable and less violent, the first step is to confess my own guilt and surrender to the forgiveness of sin we have in Christ. If I don't let God heal me of the hatefulness of sin, my self-hate will only come out in further disregard and contempt for others. It is by the experience of the God who loves the sinner in Christ that I can learn to love my fellow sinner. O.k. It's been noticed and noted that I sometimes start singing "Do You Really Want to Hurt Me" for no (apparent) reason. I just need the world to know that it's this version in particular--which is quite apart from the original--that is permanently wedged in my imagination. Maybe this isn't a big thing, but maybe it is. Maybe it's a little edge of a big thing. Not sure yet. I'll keep praying. 1. My sense of what it means to be Franciscan (and to be a Franciscan is my first desire as a Christian) centers around something Francis called 'most high poverty.' The Franciscan charism is not first of all about serving the poor, helping the poor, or advocating for the poor, but about becoming poor oneself. It is not just about adopting a lifestyle of material poverty or an interior disposition of spiritual poverty, but an evangelical synthesis of both. It does not demand living among and working with other poor people in an absolute way, but such has something of a normative force ever since Francis found that it was among the lepers that the bitterness of this world could be changed into 'sweetness of soul and body.' I too want this sweetness which Francis famously tasted, and I believe that the shortest route to it is to find my poverty with other poor people. 3. Pastors of parishes that serve poorer areas and poor folks tend to be on the more 'liberal' and 'progressive' side, and this tends to include their approach to the sacraments and the liturgy. In this current little funny moment of my life, expecting to take on a totally new assignment in Rome in the spring, I have been asked to seek part-time, temporary work in the meantime as something good to do and for the support of the brothers. Since the priesthood is my only real professional competence or credential, I have been seeking priestly work from local pastors. But here's the thing. Because of the (2) and (3) above, I am more comfortable seeking such work in parishes that are not in the poorest places, and so my examinations of conscience are sometimes asking me if I am failing in (1). In other words, my conscience is asking me whether my faithfulness to my priesthood is coming into a tension with my faithfulness to my Franciscanism. Maybe it's a creative tension. Maybe it's an invitation to a new sort of synthesis or sense of my vocation. Maybe God is telling me to let of something, or grab onto something else. We'll see. I'm at a liminal moment in my vocation after all, and God is all about liminal moments. And maybe it's no big deal, but maybe this is pointing to something the Holy Spirit is asking me to adjust inside about how I desire Christianity in my particular state of life as a friar-priest. It's a ragged reflection, both inside and in this post, but it's the edge where my heart and conscience and prayer are right now. In one of the parishes where I have been helping out, confessions are heard in a little room that probably used to be sacristy storage or a flower room or something like that. Sitting in there the other day (there were no customers) I was looking at the crucifix on the opposite wall. I noticed that it looked like one of those old-fashioned 'sick call' crucifixes. I had only seen them in pictures, so with all of my convert curiosity (may I never lose it, Lord! ), I took it off the wall to investigate. Sure enough, the crucifix proper slid up to reveal the cruciform base with holes for candles on the arms and a slot to display the crucifix on top. In the middle cavity were the two little candles and a tiny bottle that I supposed was for holy water (I couldn't tell if there was anything in it.) These were wrapped in cellophane with some folded paper. I was very curious to know what was on the paper, but I didn't want to open the little package. I put the thing back together and returned it to the wall. As I continued to sit there, I just reflected on it as an object. (There still weren't any customers.) I began to think about how intense and effective a symbol this sick call crucifix could be in someone's home--the rituals and prayers for the occasion of death being contained within the image of the Lord's own passion and death. Indeed, it is our sanctification and our salvation that our own death--whether we are talking about the death we live in because of sin or the bodily death to which it all tends--is gathered into the death of Jesus Christ. As an object of practical devotion, the sick call crucifix held this fundamental good news of our faith within its own practical design. The moment of prayer and sacrament offered at our death is contained in his. The sick call crucifix displayed reminds us that our bodily death, whenever it comes, is nothing to fear, because we already died in Christ at our baptism. Like the little candles hidden in the crucifix, our death has been hidden in Christ since that day. Traveling last weekend I was caught in the snowstorm and took refuge at our friary in Middletown, Connecticut. It was good to see the friars, and to enjoy the peace of the empty, found time. One of the things I did while I was there was read some of a book on the lives of the North American martyrs. One scene struck me especially. In the midst of torture, one of the priests wrung a few drops of water from his wet clothes in order to baptize another victim who was ready to accept Christianity. That's just one of many moments that illustrate how driven these missionaries were, how convinced they were that the eternal salvation of souls was at stake in their ministry. How far we have come from such zeal! Yes, of course it's a good thing that we have removed superstition and magical thinking from the practice of the sacraments. But on the other hand, do we really believe them necessary? I once heard a homily at an infant baptism in which the priest said that the baptism was simply an outward celebration of the divine adoption that the child had already received. Is this what the Church teaches? One of the friars I live with suggests that we should examine our consciences on whether or not we have a 'passion for salvation.' Perhaps that's something like what used to be called a 'zeal for souls.' Do we really believe, as ministers of the gospel and priests of Jesus Christ, that the eternal salvation God desires for every person has some dependence on our faithfulness to our own call, to our finding the energy and motivation to become the holy religious and priests we have promised to be? Or have we accepted, either consciously or in subtle, uncritical ways, the creeping universalism of our time, in all of its power to absolve everyone from responsibility? How many funerals have you been to in which the immediate, beatific destiny of the deceased is beyond question, and there is no sense in which the Mass is an offering for his or her continuing salvation? If everyone (and their dogs and cats) automatically 'go to heaven,' then what zeal could there be for the baptism with which the Risen Lord sends forth his disciples to all nations? Or how much have we accepted the comfortable, civil theology of 'many paths to one divine something-or-other' as we stick our 'Coexist' bumper stickers on our cars and congratulate ourselves on our enlightenment? Never mind the fact that this 'theology' implies that God is an incompetent self-revealer; many of us have let it into our heads so that we don't have to say that anybody else might be wrong, the cardinal sin of our relativistic world. Let us cast off these glittering errors of the world and allow grace to cultivate within us the direct imitation of God which is a zeal for souls and a passion for salvation. The Ordinary Time volume of the Kleines Stundenbuch, which is sort of like Shorter Christian Prayer in German. Liturgia de Las Horas para los fieles, which is like the Shorter Christian Prayer in Spanish. I'm not sure where iBreviary fits into this. The observance we make today goes by many names. In English we usually call it All Souls Day, but it’s also known as the Day of the Dead, El Día de Los Muertos, or as it’s officially called, the Commemoration of all the Faithful Departed. Whatever we call it, today is a day that the Church sets aside in a particular way to pray and offer Masses for our beloved dead. When we reflect on our laudable practice of praying for the dead, we can’t get away from talking about purgatory. This is because if our beloved dead have completed their journey to God and find themselves in the fullness of his presence—in the ultimate destiny we call heaven—then their feast day was yesterday on All Saints Day, and it is they who should be praying for us! And if, God forbid, someone finds themselves in hell, then there isn’t any use praying for them anyway. Keep in mind, though, that though the Church has always affirmed hell as a kind of logical possibility for the final destiny of human freedom, she has never claimed or affirmed that any human soul actually went there. Apart from the devil and his angels, hell might be empty. In the midst of the two final destinies of heaven and hell we affirm the process of purgatory. We are not talking about a place, but a process. Sometimes we have this idea that purgatory is some kind of awful thing with fire and torments and all that. I’m not sure that this is the right approach. I’ll tell you right now, if I die today and I find myself in purgatory, I’ll be overjoyed! Why? Because, brothers and sisters, purgatory has only one exit, and that exit is the eternal joy and peace of the perfect vision of God, the blessed destiny of heaven. To be in purgatory is to be on the way to heaven, and there is nothing more anyone could ever want. In fact, my friends, purgatory is not about punishment for sinners, but about God’s mercy on those who have already been saved and destined for heaven by their baptism into Christ’s death and Resurrection. The process begins at our baptism. We are freed from sin and configured to the perfect humanity of Christ. In the course of our life from that day on, we are called to grow in faith and holiness. Though we are free from sin by baptism, the wounds and injuries of sin remain in our hearts, minds, and bodies. That’s why we still struggle with selfishness and sin over the course of our baptized life. Now, if at the end of our life, whenever it comes, we have not yet fully freed ourselves from our attachment to the selfishness and sin, God provides a means for us to continue our purification after death. This final process of purification we call purgatory. See how gentle and merciful God is to us! God passionately desires the salvation of every human soul, and even if we don’t succeed in letting God make us perfectly good and holy in this life, he will purify and prepare us for heaven in the life to come. That’s why I would be overjoyed to find myself in purgatory. I find it very comforting. With all of my sins, I know that even if I don’t succeed in becoming a saint in this life, God will make me one in the life to come. Purgatory is one more sign to us that God’s love and desire to bring us to the perfect joy of himself is stronger than sin. God’s desire to save the world will not be thwarted by something as stupid as my sins. We don’t know what this process of purification will be like. We don’t know if it takes time—as we know it—or if it happens in an instant awareness of God. But today is a day to pray for those who are in the midst of this final, purifying journey to heaven, that through the communion of saints our prayers might speed them on the way to the final destiny we all look forward to: the eternal joy and peace, the perfectly satisfying vision of God we call heaven. Here's how it goes in one of your courses: You are assigned a textbook or two and a bunch of articles to read. If you're lucky, you are also made to read some primary sources. Then you hear some lectures and participate in some discussions, which might or might not be illuminating. Then you have to write papers or even give a presentation. But here's the thing, if the papers you write or the presentations you give only serve to reproduce the lines of argument and theological assertions of the textbooks and articles you were assigned, or the lectures you heard, you are not receiving an education. You are only allowing yourself to be socialized. The textbooks you are assigned often do a marvelous job of summarizing and serving up centuries of theological reflection on divine revelation and reasoned reflection of God's action in the world. But in doing so they all have embedded in them very certain choices of theological opinion. This is even more the case with articles. Even the primary sources you are assigned have been selected from various possibilities. This isn't about the tedious old divisions of liberal and conservative, progressive and traditional, etc. Being socialized into learning to utter the slogans and pet concerns associated with any of these labels is boring and beneath your intellectual dignity when you can have a real theological education instead. So, do your homework. Read the things assigned to you. But when it comes to a chance to reflect upon theological questions yourself, go further and deeper. First, pick up your Bible. What do the Scriptures say about the question or topic at hand? Second, read your Catechism. Or better, read your Catechism alongside your Denzinger. Don't have one of those? Click here and order one. Not later, now. Don't settle for being socialized into the 'theological imagination' of your school or the 'correct' opinions of the authorities in your life, whatever camp these fall into among the factions of this tired world. Stay close to the Scriptures, stay close to the living tradition of the Church's teaching. Be empowered, and be educated.